Daffodils Mean Spring is Coming! During the least colorful part of the year, after the Christmas lights are stashed away and before spring flowers blossom, we console ourselves by looking at seed catalogs or a nice blog post about the flowers to come. I've heard that people are seeing daffodil sprouts around town, which is exciting. No blooms yet, at least where I am, but the daffodils (and spring) will be here soon! Photograph by Flickr user Gail Johnson. Daffodils, Narcissus, jonquils, March blooms, these terms all refer to the flower that comes back every spring on roadsides, hills, and flower gardens over a large part of the Northern Hemisphere. They are a part of the Amaryllis family, and many types grow wild. According to the American Daffodil Association, there are 13 different divisions of daffodils, each with a different look. They come in all sizes, shapes, and colors, which serious growers raise for competition, and casual gardeners try out for something new and different. Photograph by Flickr user code poet. 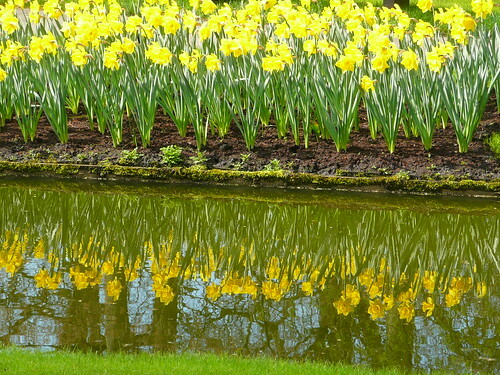 The flower Narcissus was named for the Greek god who fell in love with his own reflection. The bell of the flower tilts downward, like someone gazing at his reflection in the water. But the word also resembles the Greek word narke, or narcotic. Daffodils are toxic, especially the bulb. The main poison is lycorine, although other toxins are present in smaller amounts. Photograph by Flickr user Steve-h. In 2009, students at Gorseland Primary School in Suffolk, England were poisoned when a cooking project went wrong. 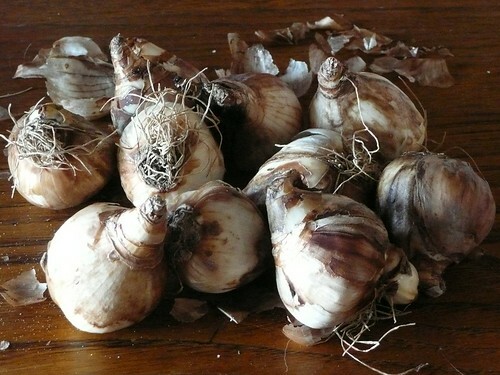 The students were using ingredients from the school's garden, and a daffodil bulb was mistaken for an onion. Twelve children were taken to the hospital, but quick intervention saved them from permanent harm. This was only the most widely publicized of many cases of poisoning resulting from mistaking a daffodil bulb for an onion. Always sniff for the onion smell when using garden onions. Photograph by Flickr user nociveglia. 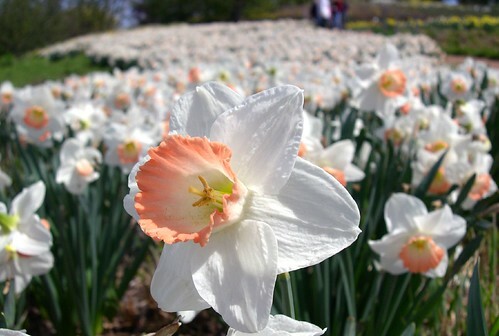 The flower also contains calcium oxalate in its sap, which can cause "Daffodil itch." The malady is mostly limited to florists who handle a lot of daffodils. Photograph by Flickr user Emma Williams. 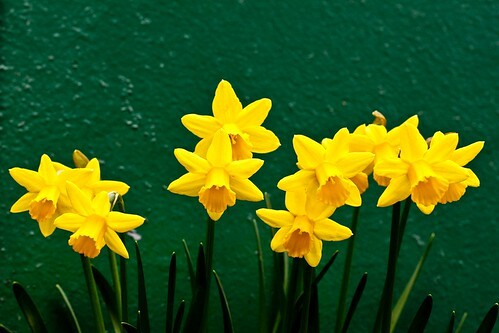 The daffodil is the national flower of Wales, and is traditionally worn on March 1st, St. David's Day. St. David was a monk in 5th century Wales who worked hard, never drank alcohol, founded many monasteries, and eventually became archbishop. He is the patron saint of Wales. St. David's symbol is the leek, so the wearing of daffodils on his feast day is more of a patriotic custom than a religious gesture. St. David's Day photograph by Flickr user Swansea Photographer. 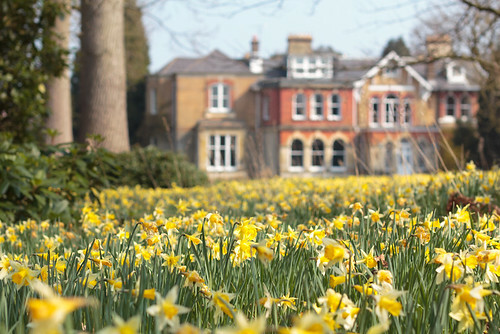 Above you see a manor in East Sussex surrounded by a sea of daffodils last spring. Photograph by Flickr user Sebastian Anthony. An old tale from China links the daffodil with prosperity. A farmer left land to two sons, but one grabbed the lion's share, leaving the other with only an acre of rocks -but there was water on that acre. A fairy granted him some narcissus bulbs, which grew and impressed people so much they bought them and made him a wealthy man. His greedy and jealous brother also planted narcissus bulbs, but they did not grow because his land, though vast, had no water supply. Even today, the legend goes, if a daffodil blooms by the date of the Chinese New Year, it is a symbol of good luck and prosperity for the coming year. In northern latitudes, this means growing them indoors and forcing the blooms. 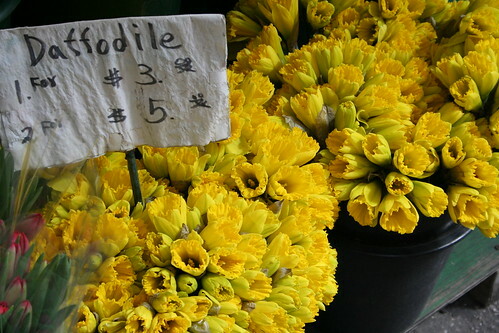 Photograph by Flickr user abac077. In the USA, daffodils bloom all over, starting in the South and working their way north throughout the spring. 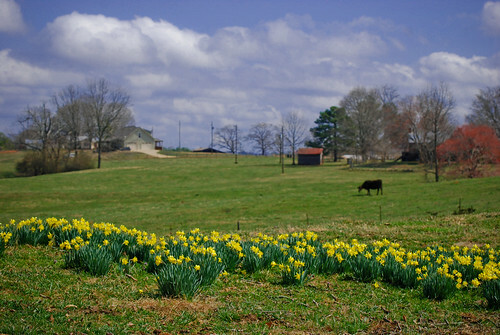 Camden, Arkansas has a Daffodil Festival early, on March 9th and 10th this year. The Daffodil Festival in Puyallup, Washington is celebrating its 79th year this spring with a series of parades in April. 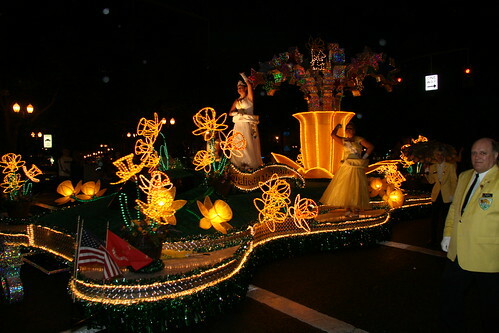 Shown here is one of the parades from 2006. Meriden, Connecticut, holds their Daffodil Festival on April 28th and 29th this year. You might find a daffodil event near you. Photograph by Flickr user Jeff Muceus. 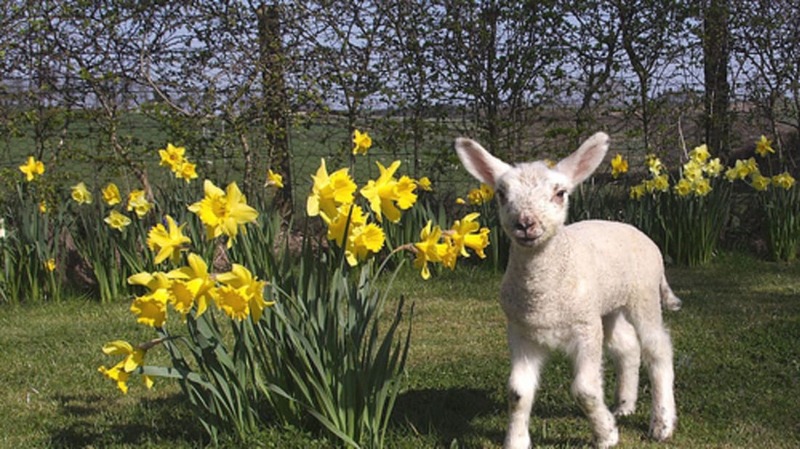 In many places, daffodils can thrive for decades with no intervention. My parents' farm had a large square of daffodils in the pasture that enshrined the spot where a previous house stood. They bloomed every spring for about forty years after that house burned down, but eventually succumbed to mowing, and the fact that I dug up a lot of the bulbs. It looked a little like this pastoral scene. Photograph by Flickr user Melinda Shelton. William Wordsworth was inspired to write the poem I Wandered Lonely as a Cloud, also known as Daffodils in 1804.